Ajax-longsleeve t-shirt senior blue. AFC Ajax is printed in white, which makes it in Ajax-style. The design is enriched with the three crosses from the city of Amsterdam. 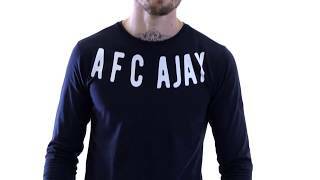 This Ajax-longsleeve t-shirt blue AFC Ajax senior is part of the official casual collection 2018-2019.